EBU SUPER MIDDLEWEIGHT CHAMPIONSHIP: THE FIGHTERS TALK! European super middleweight championship: Mohoumadi and Brischetto talk! 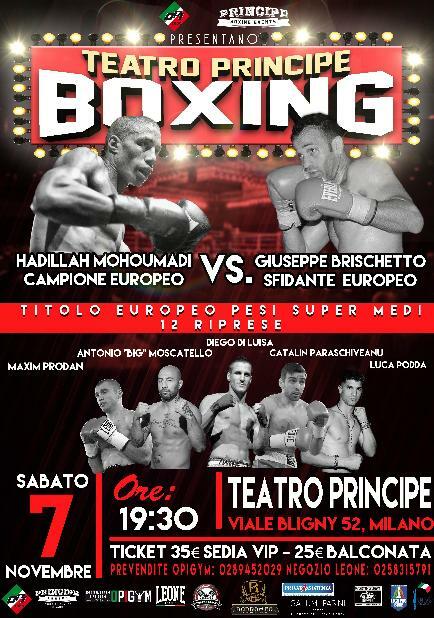 Milan, November 3, 2015 – Next Saturday, European super middleweight champion Hadillah Mohoumadi (France, 19 wins – 14 inside the distance – 3 losses and 1 draw) will defend against Giuseppe Brischetto (13-3) at Principe theater in Milan (Italy). Mohoumadi is a former French champion and is coming from the biggest win of his career as he stopped in eight rounds Mariano Hilario in Spain last May for the vacant EBU crown. Mohoumadi signed with Milan-based company Opi 2000 led by Salvatore Cherchi and is training at Opi Gym in downtown Milan with famed trainer Franco Cherchi, who was European flyweight champion in 1985.